Hold on to your (birthday!) hats because it’s about to get all colorful and confetti’d up in here! 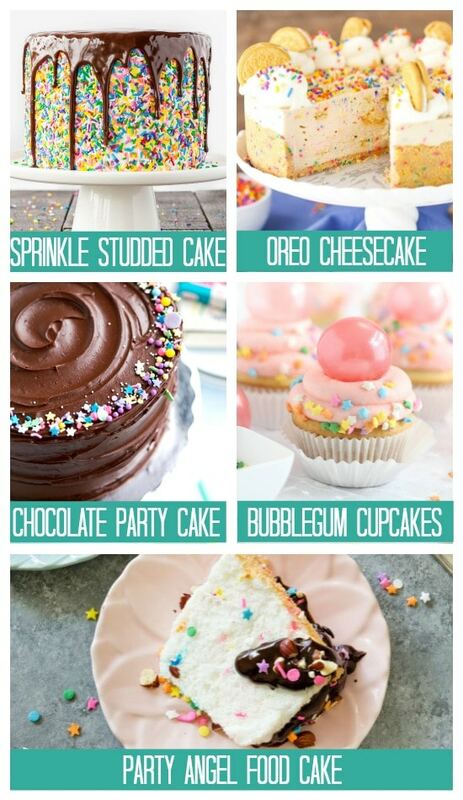 We’ve compiled a list of over one hundred of the sweetest, sprinkley-est, and oh-so-celebratory treats that just scream ‘birthday’- and taste even BETTER! 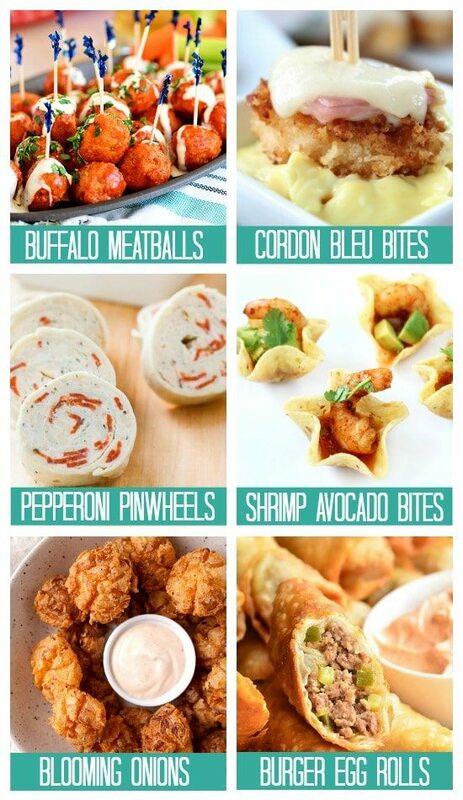 From quick and easy cakes to fabulous finger foods, you’re sure to find something that will satisfy the pickiest of palettes. Make a wish and get ready to party as we present a list that’s filled with frosting and a whole lotta fun…fetti! The b-day treat that can’t be beat, this cakey concoction is positively crucial to any birthday bash – and tastes great too! And as a happy birthday bonus from us to you, we’ve included a number of less traditional options to please all tastes and fancies! Cookie cake, anyone? 1. Ice Cream Cupcakes (Like Mother Like Daughter) – This sweet and tasty treat blends the best of both ice cream and cake into one, easy to hold dessert! 2. Funfetti Cookie Cake (Wine and Glue) – Everyone’s favorite birthday flavor takes on a whole new form with this cookie-fied concoction! 3. Cookie Dough Cupcakes (Sprinkles for Breakfast) – Guests will be drooling over these cookie dough infused cupcakes and we are too! 4. Cookie Cake (Garnish & Glaze) – Why settle for either cookie or cake when you can have both?! 5. Cone Cupcakes (Blahnik Baker) – Filled with flavor and topped with fun, these cone-covered cupcakes should be on everyone’s birthday list! 6. Galaxy Cake (Sweetapolita) – Purple lovers will be obsessed with this purple studded piece of perfection. 7. Cake Batter Cookie Pie (Crazy for Crust) – Cake batter gets a unique overhaul with this cookie-based pie! 8. Marble Cupcakes (Two Sisters Crafting) – Talk about tasting the rainbow! These colorful cupcakes take party time to a whole new level! 9. Piñata Cake (A Designer Life) – We can’t get over the genius (and taste factor!) behind this fun, filled cake! 10. Waffle Cake (Sprinkles for Breakfast) – Turn ordinary breakfast foods on their head with this waffle-inspired cake; perfect for that special birthday morning! 11. Mini 3-Layer Cakes (Style Me Pretty) – Fabulously fun-sized, and almost too cute to eat, these mini layer cakes made with this cut mini pan make for the perfect (mini!) dessert! 12. Animal Cookie Cake (A Subtle Revelry) – Studded with everyone’s favorite sprinkled cookie, this animal cookie cake is sure to be a smash with the younger crowd. 13. 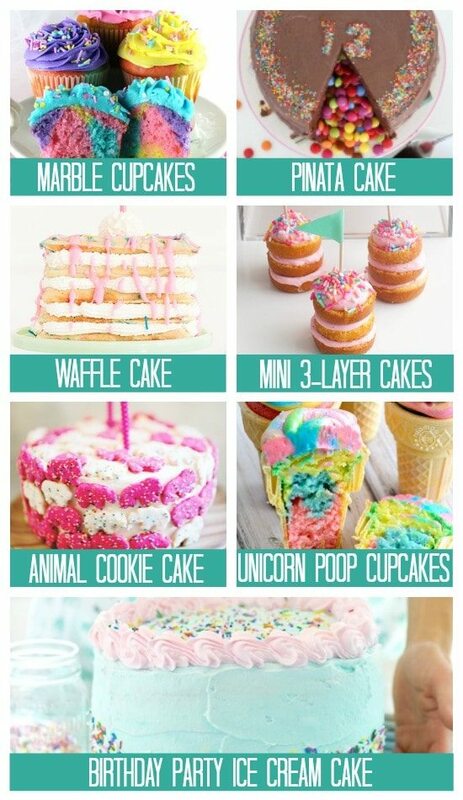 Unicorn Poop Cupcakes (MomDot) – We can’t help but chuckle when we hear this cupcake-filled cone’s name, and we think that’s a good thing! 14. Birthday Party Ice Cream Cake (Sweetapolita) – Infused with your choice of birthday flavored ice cream, this gorgeous cake is surprisingly simple! 15. Birthday Waffle Cake (Jenny Cookies) – Stuffed with sprinkles and drizzled with goodness, this waffle cake won’t last long! 16. Strawberry Cupcakes (Sprinkle Bakes) – Perfectly pink and so sprinkle-licious, these strawberry cupcakes are a perfect fruit-flavored birthday treat! 17. Funfetti Pancakes (Tastes of Lizzy T) – Give ‘em a stack that will keep them celebrating for days with this fun(fetti!) dessert. 18. 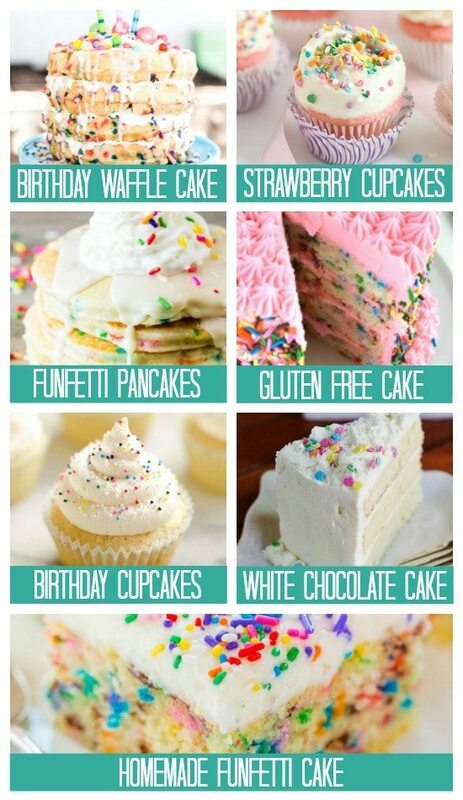 Gluten Free Cake (What the Fork) – Gluten free lovers, we haven’t forgotten you! This beautiful treat will ‘take the cake’ and have everyone begging for seconds! 19. 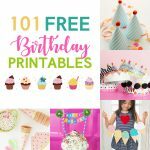 Birthday Cupcakes (The Creative Bite) – A whipped buttercream frosting and simple vanilla cake come together in the best of ways with these birthday-themed cupcakes! 20. White Chocolate Cake (The Kitchen is My Playground) – Give traditional chocolate cake a run for its money with this white chocolate version that looks positively divine. 21. 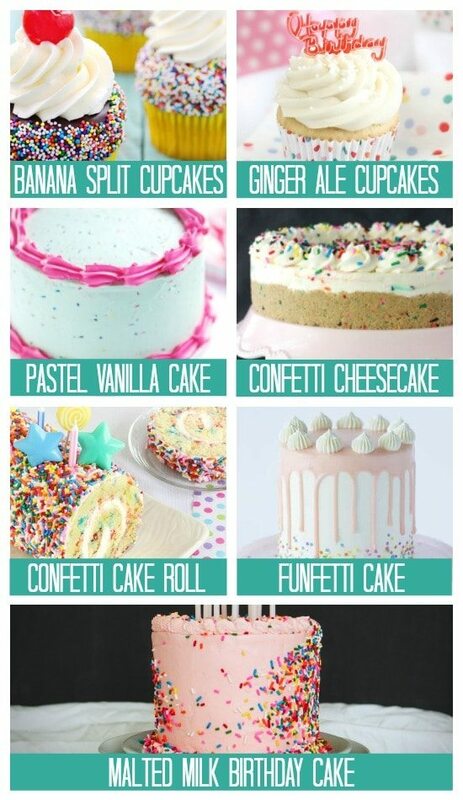 Homemade Funfetti Cake (Averie Cooks) – Forget the boxed stuff and create your own tasty funfetti cake with this party-perfect recipe! 22. Banana Split Cupcakes (Bakers Royale) – Leave the melting ice cream mess for someone else. These banana split cupcakes will give you all of the flavor in an adorable hand-held package! 23. Ginger Ale Cupcakes (Sprinkle Bakes) – Everyone’s favorite fizzing beverage takes center stage in these beautiful birthday cupcakes that will be gone in a second! 24. Pastel Vanilla Cake (Sweetapolita) – Stunning meets simple in this vanilla flavored layer cake that has our mouths watering. 25. Confetti Cheesecake (Life, Love and Sugar) – Give yourself a little birthday break with this no-bake treat! 26. Confetti Cake Roll (Betty Crocker) – Betty has done it again with this confetti cake roll that is so ‘birthday’ we can’t even believe it. 27. Funfetti Cake (Preppy Kitchen) – You’ve never seen a funfetti cake that’s as chic as this one, and that tastes great too! 28. Malted Milk Birthday Cake (La Peche Fraiche) – Give traditional cake flavors the boot in favor of this malted milk version that’s as gorgeous as it is good. 29. Sprinkle Studded Cake (Liv for Cake) – Well hello, beautiful! This sprinkle-studded, chocolate-drizzled concoction has us counting down the days until our birthdays! 30. Oreo Cheesecake (Life, Love and Sugar) – Golden Oreos are front and center in this no-bake cheesecake that is about as close to perfection as you can get! 31. 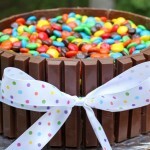 Chocolate Party Cake (Sweetapolita) – Chocolate lovers, unite and let this dreamy, creamy party cake take center stage! Spoiler alert: it won’t last for long. 32. Bubblegum Cupcakes (Sprinkle Bakes) – Add a little whimsy to your special day with these bubble topped cupcakes that are literally too cute for words. 33. Party Angel Food Cake (Sally’s Baking Addiction) – Light, airy, and as angelic as can be, this party cake is one you’ll want to make again and again. Not a cake fan? We’ve got you covered! 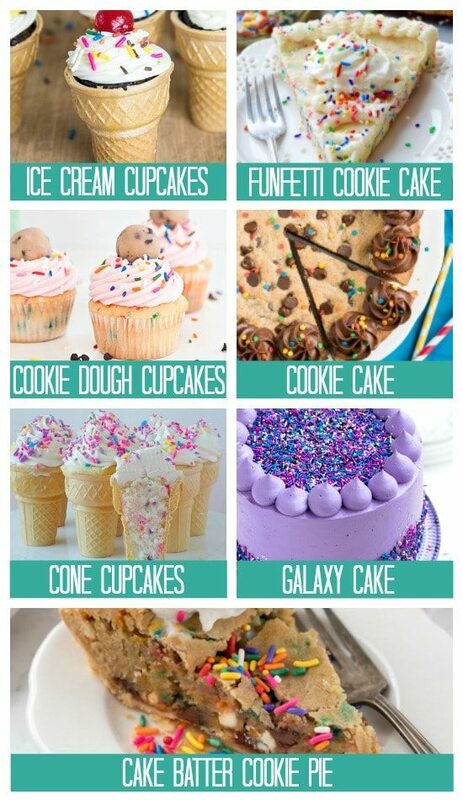 Take a gander at these simply sweet treats of all things sugary- with none of the slicing! 35. Sugar Cookie Bars (Sally’s Baking Addiction) – Pile on the frosting and pass us some more of these crowd pleasers! 36. Soft Sugar Cookies (Six Sisters’ Stuff) – Say goodbye to those crisp cookies of the past and sink your teeth into these super soft wonders. 37. 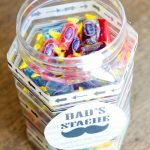 Birthday Oreo Pops (The Love Nerds) – Dunked in color and topped with fun, these birthday pops will be especially popular with the kiddies! 38. Gooey Cake Bars (Bake With Christina) – Who says funfetti comes in a cake? Not us! 39. 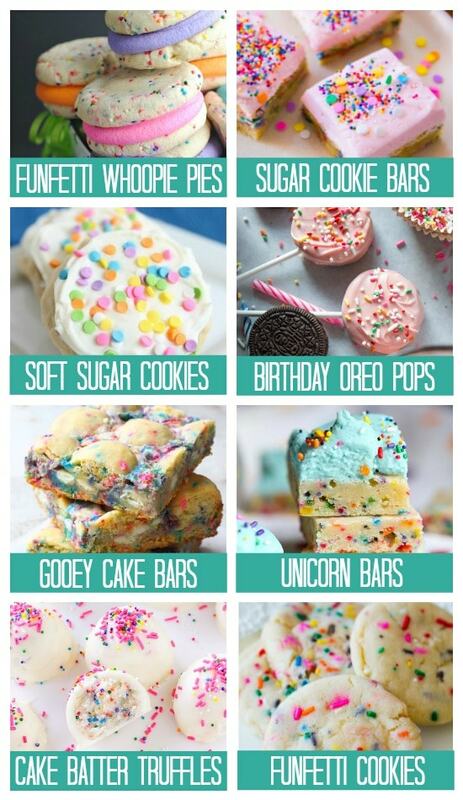 Unicorn Bars (Cookies and Cups) – Bright, whimsical, and filled with an extra dose of magic, these special bars are at the top of our list. 40. Cake Batter Truffles (Deliciously Sprinkled) – Simple, sweet, and perfectly bite sized, these terrific truffles are an absolute must. 41. Funfetti Cookies (Sally’s Baking Addiction) – We don’t think you can ever have too much funfetti and these soft-baked cookies prove that to be true! 43. Funfetti-Chip Cookies (Baked By Rachel) – Funfetti meets chocolate in these birthday cookies you won’t be able to put down! 44. Funfetti Rolls (The Little Epicurean) – Give your rolls a little birthday boost with this funfetti-version that has us all sorts of excited! 45. Doughnut Hole Pops (A Subtle Revelry) – We say food on a stick is always more fun and this doughnut-y treat is Exhibit A. 46. Confetti Oreos (Sprinkles for Breakfast) – If there’s anything that can make an Oreo more special, it’s gotta be THIS! 47. Circus Truffles (Make Bake Celebrate) – Crack open the cookies and get ready to rumble because these truffled treats are comin’ your way! 48. Cake Batter Treats (I Heart Naptime) – Jazz up an ordinary krispie treat with this extraordinary birthday version for major brownie points! 49. Popcorn Balls (Annie’s Eats) – ‘Pop’ up a healthy dose of fun with this classic treat! 50. Vanilla Cake Truffles (The Seaside Baker) – Let this recipe help you truffle it up in style! 51. Funfetti Donuts (Sally’s Baking Addiction) – Baked is the name of the game with this healthier version of everyone’s favorite treat. 52. Sprinkled Cookies (Just Add Sprinkles) – Set your sprinkle power to HIGH with these colorful cookies that are about as cute as can be! 53. Frosted Cookie Bars (Delightful E Made) – Rick, thick, and positively delightful, we can’t wait to try these frosted cookie bars. 54. 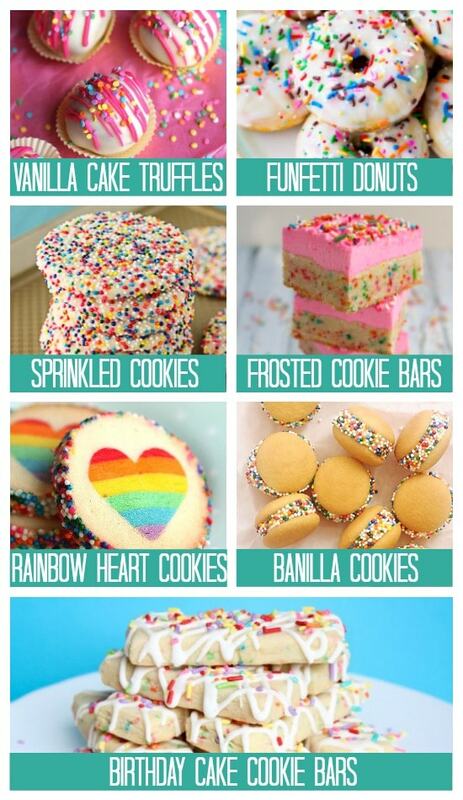 Rainbow Heart Cookies (Eugenie Kitchen) – Sporting a lovable birthday message, these ‘heart-y’ cookies will tell that birthday someone just how much you love them! 55. Banilla Cookies (Bakers Royale) – Rolled in sprinkles and stuffed with banana, these super speedy (and quite healthy) treats are perfect for a bite-sized bit of goodness! 56. Birthday Cake Cookie Bars (Make Bake Celebrate) – Combine color and sweetness and you’ve got yourself these fabulous birthday bars that are definite crowd pleasers. What better way to celebrate the day than with a cool and creamy treat topped with a little bit of sprinkles and a lotta bit of love?! 57. Circus Cookie Shake (Salty Canary) – This is one birthday shake that will have you feeling like a total party animal! 58. Birthday Milkshake (The TomKat Studio) – Simple, sweet, and packed with birthday flavor, you’re going to wanna give this milkshake a sip ASAP! 59. Marshmallow Shake (Mindy’s Meals on Heels) – Swirled with color and possessing the magic of marshmallow, this confetti milkshake is a spectacular party addition. 60. Cotton Candy Shots (Half Baked Harvest for Tablespoon) – Unleash your wild-side with these alcohol-free and kid-friendly shots that are packed with cotton candy flavor! 61. 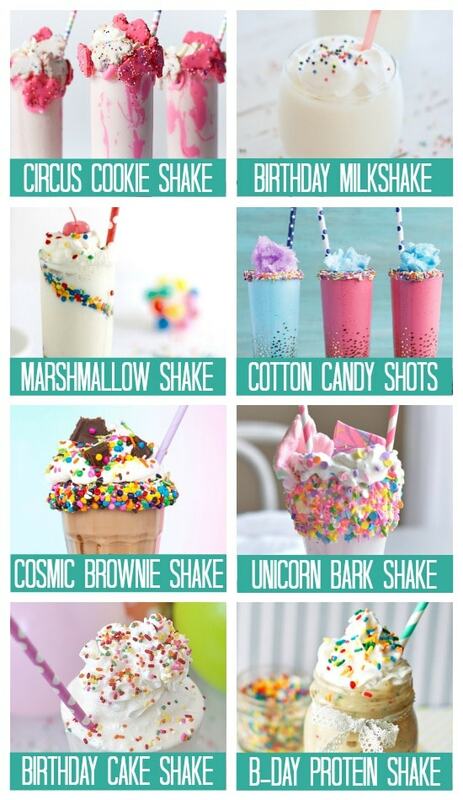 Cosmic Brownie Shake (Aww Sam) – Brownie, you say? We are SO there! 62. Unicorn Bark Shake (Bethcakes) – If there’s anything more magical than this unicorn bark shake, we don’t know where to find it! 64. B-day Protein Shake (Kelley & Cricket) – Wanna have your cake (shake!) and eat it too? Now you can! 65. Golden Oreo Ice Cream (Blahnik Baker) – This recipe will help you put the goodness of Golden Oreos into your very own ice cream! A total win-win! 66. Unicorn Ice Cream (Bread Booze Bacon) – Unleash YOUR inner unicorn with this colorful ice cream that tastes as good as it looks! 67. 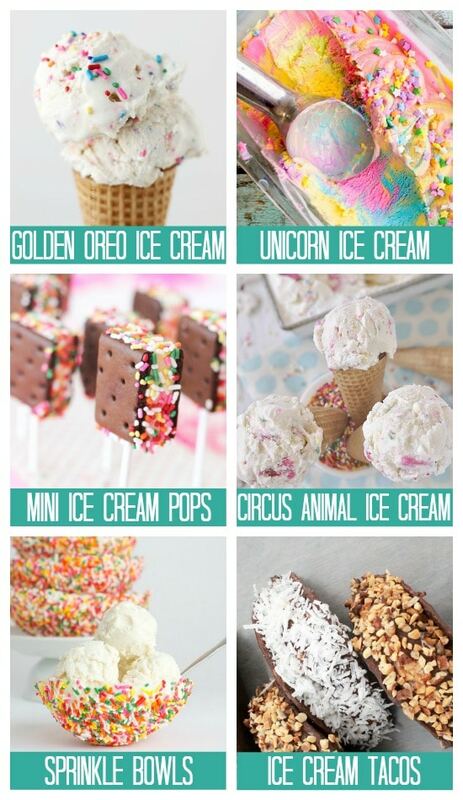 Mini Ice Cream Pops (Girl. Inspired.) – We just can’t get over the level of cuteness to be found in these pops! 68. Circus Animal Ice Cream (Your Homebased Mom) – Cool down the party with a little help from your favorite animal cookie and a healthy dose of chill-factor. 69. Sprinkle Bowls (This Heart of Mine) – Looking for an easy way to liven up that ice-cream bar? Look no further! 70. Ice Cream Tacos (Pretty Providence) – Flip the traditional taco upside down with this dreamy, creamy version that will be a total hit. 71. Marshmallow Cones (Jelly Toast) – Marshmallows aren’t just for roasting, ya know! 72. 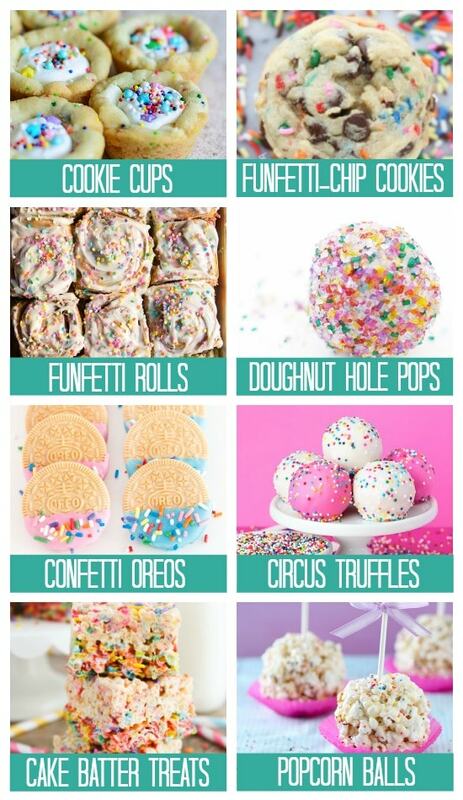 Funfetti Ice Cream (SugarHero) – Filled with real donut goodness and so totally doable, this easy funfetti ice cream should be at the top of your list! 73. Cake Batter Ice Cream (Life Made Sweeter) – With only four ingredients and no churning necessary, you’re gonna want to save this clever ice cream idea! 74. 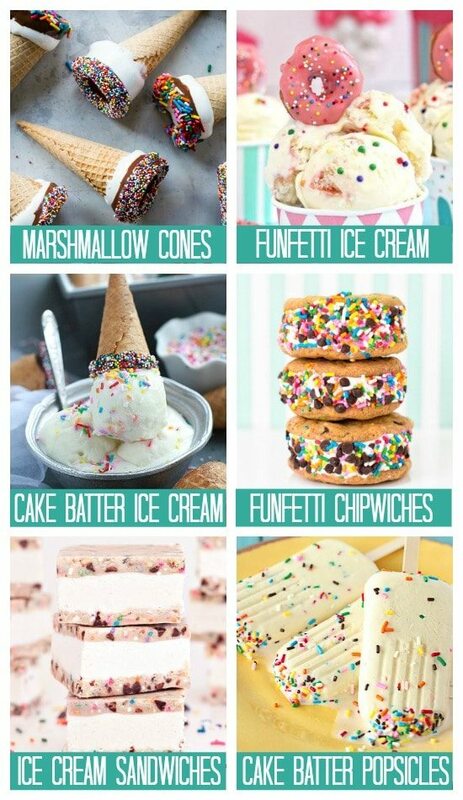 Funfetti Chipwiches (Studio DIY) – Brace yourself, because ice cream sandwiches are about to get a whole lot CUTER! 75. Ice Cream Sandwiches (Sprinkles for Breakfast) – Cookie dough lovers will be obsessed with these bad boys that are just bursting with said flavor! 76. Cake Batter Popsicles (Just Add Sprinkles) – We say stick it on a stick and you’re totally set! 77. Mini Quesadillas (Cookin’ Canuck) – Chic and delicious, these mini quesadillas take party food to a whole new level! 78. 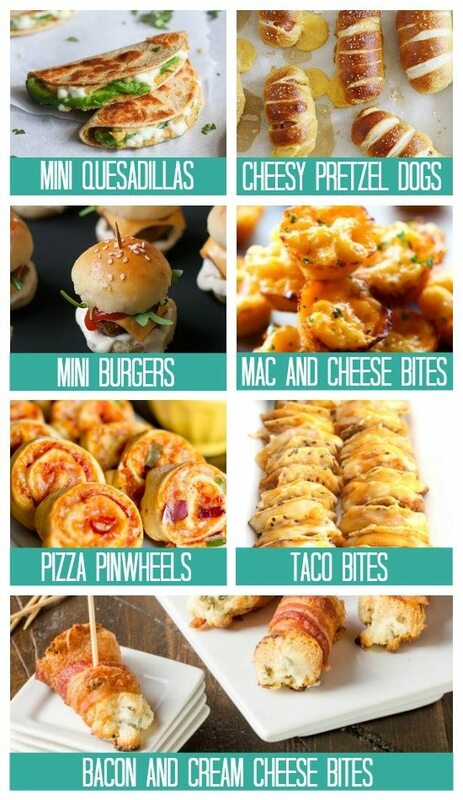 Cheesy Pretzel Dogs (Well Plated) – Unleash the power of the pretzel dog with these mini marvels! 79. Mini Burgers (Palachinka) – So perfectly bite-sized and just bursting with flavor, this mini burgers will take the party from ordinary to extraordinary. 80. Mac And Cheese Bites (Chef In Training) – Forego the pot for these itty-bitty morsels that are so kid-friendly, it’s crazy! 81. Pizza Pinwheels (Yellow Bliss Road) – Roll ‘em on up, and pass ‘em around! These pizza pinwheels won’t last for long! 82. Taco Bites (The Baker Mama) – Only a handful of ingredients are needed to whip up these quick and easy ‘tacos’ that will please even the pickiest of palettes! 83. Bacon Cream Cheese Bites (Garnish With Lemon) – We say the more bacon the better, so these party bites have us all sorts of pleased! 84. 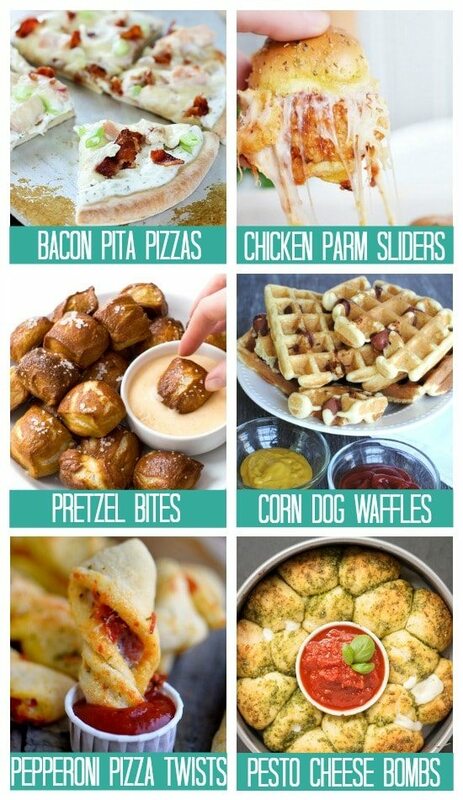 Bacon Pita Pizzas (Yummy Healthy Easy) – Opt out of the pepperoni and whip up these quick and easy pita pizzas for ultimate birthday satisfaction! 85. Chicken Parm Sliders (Home Made Interest) – Put a party spin on a classic dish that’s as fun to eat as it is to make! 86. Pretzel Bites (Chef Savvy) – Dipped in cheese and loaded with flavor, our mouths are already watering over these quick and easy pretzel bites! 87. Corn Dog Waffles (Pennywise Cook) – Hosting a birthday breakfast soiree? 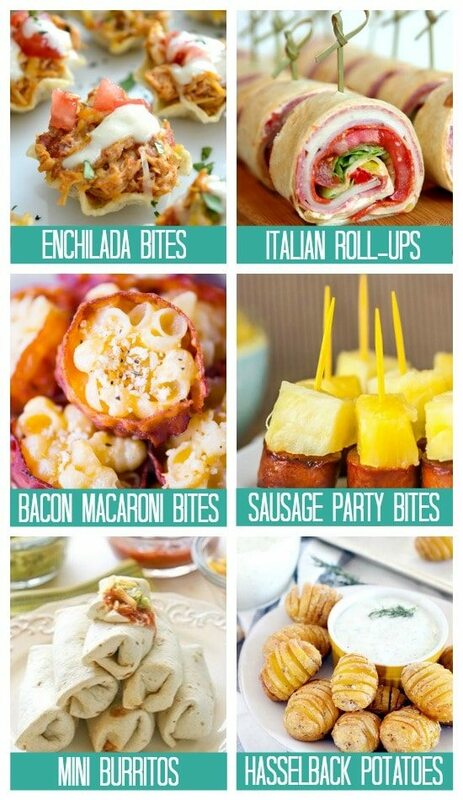 You NEED to take a look at this party-friendly food! 88. Pepperoni Pizza Twists (Mom on Timeout) – Dip, eat, repeat. 89. Pesto Cheese Bombs (Self Proclaimed Foodie) – Stuffed with cheese and exploding with flavor, these pesto cheese bombs are soothing, savory, and Mmm-mmm-good. 90. Buffalo Meatballs (Tidy Mom) – Wing lovers will be all over the flavor of this clever chicken meatball dish and we are too! 91. Cordon Bleu Bites (Great Grub, Delicious Treats) – For total tummy satisfaction, with a burst of birthday elegance, we wholeheartedly recommend these cordon bleu bites! 92. Pepperoni Pinwheels (Rachel Cooks) – Packed with pepperoni, in an aesthetically pleasing package, these rolled-up treats are perfect for kids and adults alike! 93. Shrimp Avocado Bites (Kim’s Cravings) – Ain’t nothin’ shrimpy about this level of flavor! 94. Blooming Onions (Macheesmo) – Put a clever party twist on a typical blooming onion with these bite-sized morsels that will be gobbled up in no time flat! 95. Burger Egg Rolls (The 36th Avenue) – It’s may be a little nontraditional but that’s what makes this recipe SUCH a treat! 96. Enchilada Bites (365 Days of Baking & More) – Infuse a little Ay Yi Yi! Into your party with these sassy enchilada bites. 97. Italian Roll-Ups (Happy Go Lucky) – Let the flavor of a sub meet the ease of a roll-up with this quick and easy recipe! 98. Bacon Macaroni Bites (The Gunny Sack) – Bacon and macaroni and cheese meet as one in this flavor-packed recipe that has us drooling. 99. Sausage Party Bites (Noshtastic) – Spicy meets sweet in this bite-friendly dish that will leave everyone asking for more! 100. Mini Burritos (Awesome Food Recipes) – Have all of the flavor and none of the fuss with these mini burritos that are positively adorable! 101. Hasselback Potatoes (Bowl of Delicious) – A smooth and creamy dill dip acts as the perfect compliment to these mini ‘taters that are dippable and delicious. Feeling full yet? 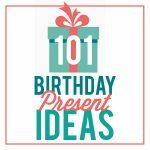 For even MORE birthday fun, be sure and check out our list of 100 Birthday Decorations, our list of 100+ Birthday Party Themes, and our list of 101 Birthday Present Ideas! Such fun ideas! My hubby always requests oatmeal raisin cookies. I know, I know- all sorts of yummy chocolate desserts to choose from and he picks raisin cookies. What can ya do? lol. My favorite birthday treat is Golden Grahams Smores!! And my hubbys is Poppy Seed cake. YUMMY! My wonderful husband LOVES when I make him my lemon cake with homemade whipped cream and garnished with blueberries…raspberries and strawberries!!! His absolute FAV!!! 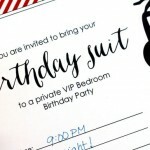 I LOVE all of these ideas for my hubby’s birthday! I just wish that you all had done this a week earlier because that’s when his birthday is. I’ve showed him all of the fun things you ladies have put together, and he LOVES it. I’ll just do it next year for him, and he won’t remember any of it so it’ll still be a surprise! Thanks, ladies for all you do! I’m addicted to your blog and new website! You shared so many and beautiful creative ideas.Love it! Thank you so much, Angel! 🙂 SO happy you loved the post!